Know when! When to communicate, and when to stay quiet. CSR communications can have great impact. Know how to make it create value, not destroy it. When it comes to good business decisions, timing is everything. 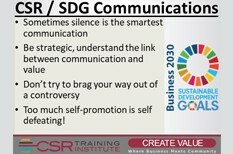 But did you know that also applies to communication around your Corporate Social Responsibility (CSR) and Sustainable Development Goal (SDG) initiatives? I have worked with clients who thought the best strategy for CSR communications was to continuously push out more and more information, often overly promotional and self-congratulatory. Even with the best intentions, this strategy does not always work. It is important to be transparent in your endeavors, but sometimes the best communication is silence, and simply letting your results speak for themselves, even if they take time to be heard. This is especially true amidst controversy. If your company is dealing with issues or receiving negative feedback in public arenas, it can be tempting to talk about all the good things you are working on and the exciting SDG Impact and CSR programs you have underway. However, this can serve as a catalyst for opposition, and you could end up with your important CSR message getting lost in the noise and negativity. When I was advising Placer Dome — a large mining company — in South Africa, they launched an incredibly ambitious and far-reaching CSR program in the midst of a huge controversy. This controversy landed them in the public eye for all of the wrong reasons, and landed them in court with the National Union of Mineworkers. It even led to the company being cited as the worst employer in South Africa. The CSR program that they launched behind the scenes had them commit several millions of dollars and endless resources, and it eventually was credited with changing the social face of the mining industry in South Africa. As tempting as it was to tell the world what was being executed being the scenes, and the exciting results the program was receiving, Placer Dome remained silent, and just went about doing the good-works they had committed to. CSR communication during this time was not necessary. The company knew that if any public discussion was opened up, those who were in a public battle with the company on other issues would jump in, creating confusion and making the CSR project less likely to succeed. After the results continued to accumulate, Placer Dome’s partners started to communicate the results. This led to an incredible public and promotional profile for the company, as well as the CSR project, which gained a global profile and received many prestigious awards, including being the first ever private sector project to win a World Bank Development Innovation Award. If Placer Dome had not been strategic and held off on communications, especially in defense of public accusations, the project would likely not have succeeded and the impact on people, communities and Placer Dome would have been very different. When deciding when the best time to communicate about your CSR initiatives, keep in mind that it does not hurt to be patient and wait for the right moment. In most cases, it could actually do more good than harm. As with all things CSR – be strategic, focus on value and impact and have a well-thought out strategy.